People with a passion for designer clothing have never been down-to-earth. But do those who long for the divine creations of Supreme Master Ching Hai inhabit a different planet altogether? FASHION designers never tire of predicting the future, forever telling us about clothes that will "take us into the 21st century". But there is one enlightened designer who is anticipating another dimension altogether. The clothes you see here are a vision of fashion as worn in the afterlife. Supreme Master Ching Hai, the designer, was born in central Au Lac 44 years ago. The day after Her birth, Her parents' house filled with light; it was then that they knew She was "a special kid". She was educated in Britain and, after marrying a German scientist, She turned to meditation in 1978, eventually achieving "perfect enlightenment" (and separating from Her husband in the meantime). Since then, She has become a spiritual leader, inspiring disciples around the world, as well as exploring Her inner talents as a poet, painter, musician, teacher, singer and designer of precious jewellery. Her latest venture is Her own fashion label, SM Fairy Clothes. SM stands for Supreme Master - the initials are embroidered in gold on a red background on the corner of each one of Her garments. And two weeks ago, during Britian's first-ever Worldwide SM Fairy Clothes Fashion Show (the word "fairy" was changed to "celestial" at the last minute), the Wembley Conference Center was suffused with a feeling of spirituality not normally associated with mere frocks. For these are not just clothes. They are the Supreme Master's interpretation of clothes worn in heaven. As one disciple, Lisha Li, explained, "These clothes should change the style of fashion and bring heavenly beauty into this world." 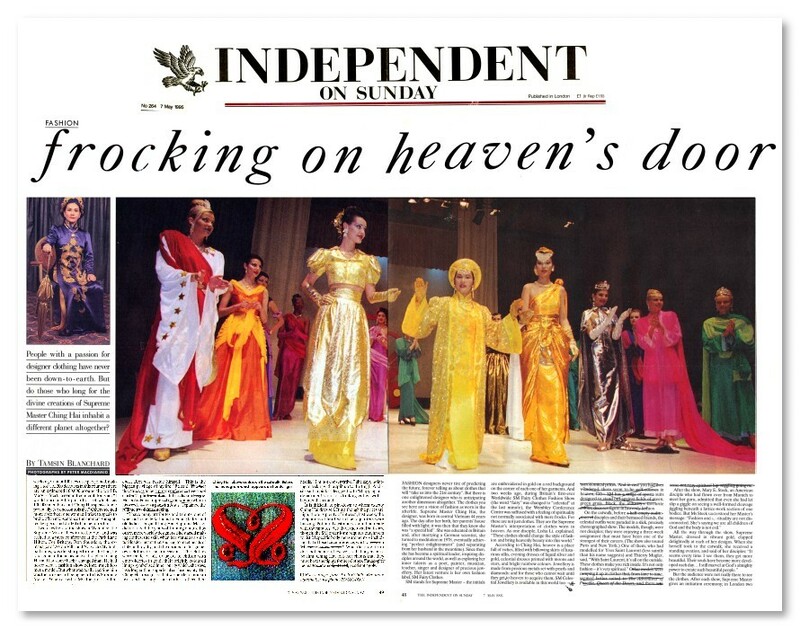 According to Ching Hai, heaven is a place full of riches, filled with billowing skirts of luxurious silks, evening dresses of liquid silver and gold, celestial dresses printed with moons and stars, and bright rainbow colours. Jewellery is made from precious metals set with pearls and diamonds: and for those who cannot wait until they get to heaven to acquire them, SM Celestial Jewellery is available in this world too. On the catwalk, before disciples and their bemused friends, the celestial outfits were paraded in a slick, precisely choreographed show. The models, though, were not disciples; they were enjoying a three-week assignment that must have been one of the strangest of their careers. (The show also toured Paris and New York.) 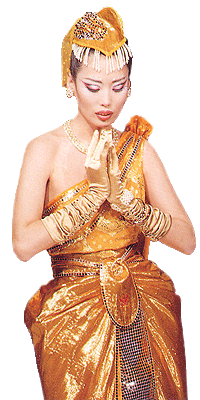 One of them, who had modelled for Yves Saint Laurent (less saintly than his name suggests) and Thierry Mugler, said, "With Saint Laurent, it's all on the outside. These clothes make you rich inside. It's not only fashion - it's very spiritual." After the show, Mary E. Steck, an American disciple who had flown over from Munich to meet her guru, admitted that even she had let slip a giggle on seeing a well-formed cleavage jiggling beneath a lattice-work section of one bodice. But Ms Steck understood her Master's message: "Fashion and spirituality are not disconnected. She's saying we are all children of God and the body is not evil." 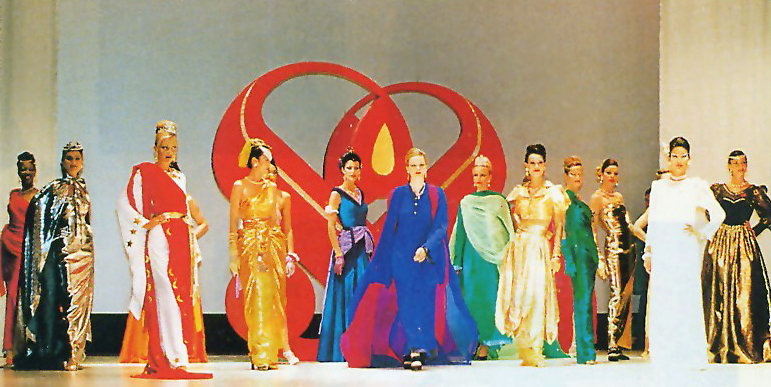 All the way through the show, Supreme Master, dressed in vibrant gold, clapped delightedly at each of Her designs. When She Herself took to the catwalk, She received a standing ovation, and said of Her disciples: "It seems every time I see them, they get more beautiful. Their souls have become more developed each day... I still marvel at God's almighty power to crate such beautiful people." But the audience were not really there to see the clothes. After each show, Supreme Master gives an initiation ceremony; in London two weeks ago, about 100 new disciples joined, making a total of 200 devotees in this country (there are an estimated 100,000 around the world). Mary E. Steck, a committed meditator, said: "I would normally be put off a sect which has 100,000 members, but Ching Hai speaks to me personally. No one controls me." Others seemed more absorbed: one woman I tried to speak to broke off in mid-sentence the moment she spotted her guru, and drifted off in Her direction. Two days before the show at Wembley, the Supreme Master flew in to London and was rushed to a press conference at the Park Lane Hilton. For Britons, Ron Saunders, the exmanager of Aston Villa and Norwich City football clubs, was the star performer: he had, he said, gone to India, become a disciple of Ching Hai and had come back a changed man. He had never seen a fashion show before, much less met a model. But what was really exciting him was the prospect of being near to his Supreme Master. When asked to MC the press conference, Ron was beside himself. "This is the biggest privilege of my life," he said. "I have many attributes and talents, one of which is to create fashions for young ladies and old ladies," began Ching Hai. Supreme Master did not need the years of training endured by other, more worldly designers. She started making clothes, She said, when Her status as a spiritual leader meant that She had to meet heads of state and royalty, and She decided to design Her own clothes for such occasions. The clothes were made of silk or layers of chiffon with embroideries in gold; their brightly coloured linings symbolized inner purity which, She says, lasts longer than superficial surface beauty. But Ching Hai recognizes that women lead modern lives and She hopes Her clothes reflect their needs. "I'm not conservative," She says, pointing to a skirt with a split up to the thigh. And a silk suit in pink is designed with "shopping in a department store or drinking coffee with a boyfriend" in mind. It is difficult to pin down to whom exactly Ching Hai does sell. But although the prices are high, there is plenty of interest; last week, the telephones at Her Oxford headquarters were buzzing. Potential customers should be ready with the minutest details of their vital statistics, though: the SM order form requires purchasers to list 24 specific body measurements - including that of head circumference, wrists. What the order form does not mention, however, is that buyers must be slim. Ching Hai tells Her clients that they must have the figure for Her clothes.